Please scroll down to read this article in English. I have had the pleasure of reading a wonderful book by the author Brené Brown called Daring Greatly. In the book, she focuses on a range of situations where people may feel shame or guilt, and she highlights parenting as a key area in which many feel guilt or shame. Many of us, including me, believe that the choices we make today – everything from which food we give our children to which school we choose – will have a lasting impact on their future, and more importantly will be a statement of how good – or bad – our parenting was. In this section of the book, she challenges parents to reconsider this, and to instead realize that we lead by example. Our children – for better or worse – will become reflections of us in many ways. As many of us already know, if we want to raise children into caring and respectful adults, we will need to demonstrate care and respect through our own actions. But, this challenge is also true in other, less obvious ways. For example, if we want our children to appreciate the importance of working toward our goals diligently, we need to show – through our actions not our words – the benefits of working hard. If we focus on our frustrations about work, for example, we demonstrate that work is tiring and frustrating – not rewarding and exciting. This is near and dear to my heart. I LOVE my work and all that I do in the community, but at the end of a long day, it is tempting to focus on the hardest aspects of this effort, and that can come out through my interactions with my boys. Because of this, instead of inspiring them to see work – and especially work in education – as rewarding and exciting, I shine a light on hard work as exhausting. This does not reflect who I am truly, and therefore I am not in fact ‘being the adult I want them to become’. Moving forward, my challenge is to show – through my actions – the value of working hard. 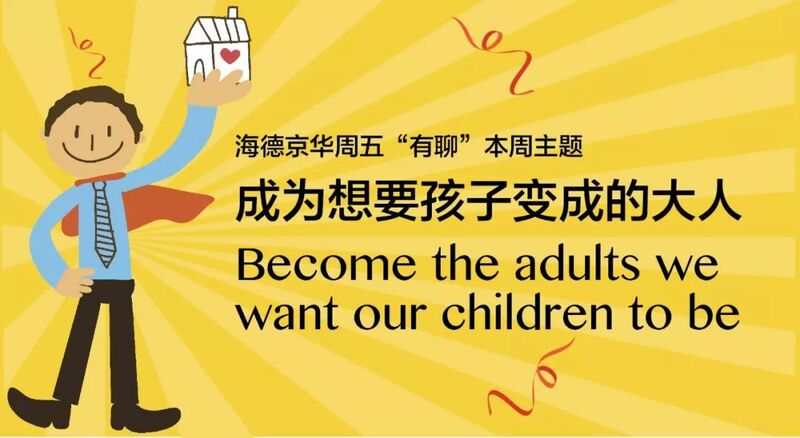 Can you think of an area where you need to ‘become the adult you want your child to be’?